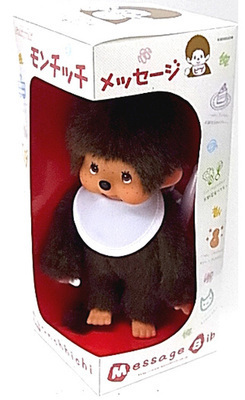 Monchhichi is a line of Japanese stuffed toy monkeys from the Sekiguchi Corporation, first released in 1974. They were licensed by Mattel in the United States until 1985, and later distributed worldwide directly by Sekiguchi. Three television series were produced based on the characters: The Japanese anime series Monchhichi Twins in 1980, produced by Tokyo 12 Channel, the American cartoon series Monchhichis in 1983, produced by Hanna-Barbera Productions, and Monchhichi in 2005, by Kids Station.